Appearance: Kenkaku stands at 5’’11 and weighs about 197 lbs. His eyes are a light caramel brown and his skin id a bit tan. He has a light beard connecting from his side burns to his chin and jaw, spreading slightly to his neck and his hair is brown and wildly unkempt to his neck. He wears white loose samurai like garb with a black ring around his waist like a belt. He dons black ashigaru greaves and gauntlets. He wears a low straw hat similar to the akatsuki’s without the paper hanging, it seems to be of significance to him, but this is unknown to others. Kenkaku does not bear the Iwagakure insignia as it is a reminder of his difference compared to the others of the village. Personality: Kenkaku is a generally happy person, usually seen with a smile, he loves to see people laughing and smiling and usually tries his best to spread joy. One thing he loves is to sit quietly by himself either in a plain or by a waterfall. Despite how happy Kenkaku usually is, when need be his smile disappearsand is replaced with a face that dignifies his duty and responsibility as a shinobi. A small child born of in a small village of the fire country. His family was poor, but were rich in love and care for the child they had, Kankaku Yasashii. Though the boy was poor, he grew up very happy. Five years the boy lived in peace and joy with his family. Fire ravaged the village and blood spattered over the ground. Kenkaku was hid in a dark place as he watched the rest of the villagers slaughtered, with them his family. The ominous figure with the blade in his hand emerged from the doom ridden orange flames. Kenkaku’s whole body shook in great fear. The evil being peered at him, the boy could do nothing but sob in anger and fear, a few seconds and then black. His eyes open slowly as he saw a shaggy man with a warm smile looking down at him. Only after some time did he realize he was in the man’s arms, and the man had killed his family. For the remainder of his childhood years he grew up with the man he would always call his enemy. He never learned his name nor did he bother, simply referring to him as “Him” or “You” or “He”. Kenkaku always found it strange and confusing that He would raise him as if he was his own sun. Even giving him the same affection his parents had. 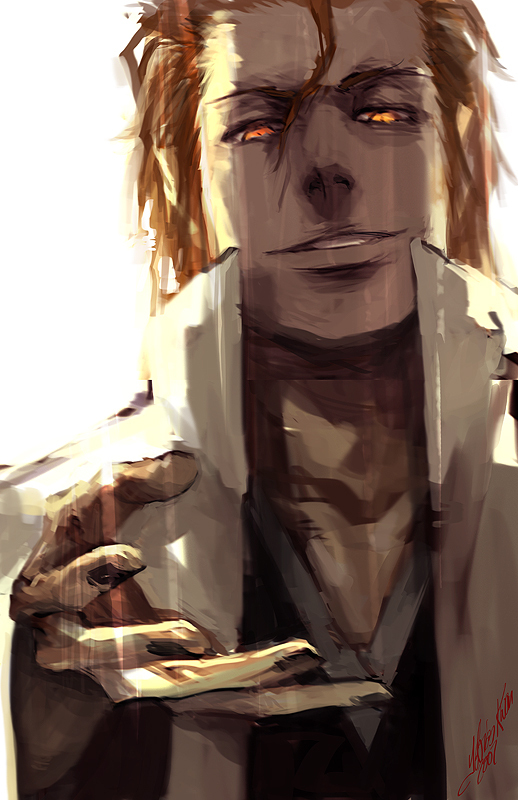 All his life Kenkaku had a mix of hate and admiration for Him, seeing Him more as a father than an enemy. When he was readt, He taught Kenkaku the way of the swordsman and trained him to be a shinobi. He gave Kenkaku a blade similar to his own and told him the blade’s name was “Kaonajimi”. During his training, hate for Him seemed to have reformed within Kenkaku as he tried to kill him several times, these attempt never seemed to bother Him but in fact amused him and only made him train Kenkaku to fight more like himself. Going into his teenage years, Kenkaku still lived as His’ apprentice, learning more from him each time. Soon Kenkakau learned all of His’ techniques, being a near mirror image of Him. Kenkaku warmed up to Him more and more each day, after some time it would seem that he now saw Him more as a father than an enemy. The two went around earth country as Him was searching for something. Kenkaku wandered off on his own for a few hours, enjoying a nice day. The boy was approached by Iwa ninja who had Him captive. After speaking with them, he figured out Him had convinced the shinobi that Kenkaku was his hostage. Kenkaku did not want to play along as he knew he was going to be put to death, Kenkaku wanted to kill him, but at the same time it could be a new beginning for him. Kenkaku played along to what Him said. They were taken to the village where Him was put to execution. Kenkaku was made a shinobi of Iwagakure and given a place to live. After the execution, Kenkaku found a straw hat in his quarters. He took it in his hands, crying both with joy and sadness. Kenkaku carried out the duties of any regular shinobi of his new village. Carrying out missions and socializing with people. Overtime he got access to the Tsuchikage’s office, becoming a more elite shinobi. After some time, Kenkaku began to feel like he had something to do. Then he realized what he wanted, to lead Iwagakure, to be a leader, He felt he owed it to his family and Him. Kenkaku had the access and skill to defeat and kill the Tsuchikage. When his opportunity came he found that somebody already killed him. He hunted down the culprits and killed them easily. After the village learned of this feat, they decided that Kenkaku should be appointed village leader. And so his story continues…. Kaonajimi:The only weapon he carries on his right side. Kaonajimi is a special katana that Kenkaku can channel his chakra through, giving him acess to special justsu. Description:Kawarimi no Jutsu is a basic Ninjutsu technique. When in danger the ninja will quickly substitute themself with another nearby object. This can be a block of wood or even another person. This allows the ninja to quickly flee and hide while the original object takes the brunt of their opponents attack. Description:Bunshin no Jutsu is a Ninjutsu technique which every ninja learns at the Ninja Academy. The Bunshin technique creates a copy of the ninja without substance. The copy resembles the ninja in every way. This clone can function as a distraction or as means to confuse one's opponent. As soon the Bunshin gets attacked or comes into contact with an opponent, it will disperse. Description:Henge no Jutsu is a ninjutsu technique which every ninja learns at the Ninja Academy. Henge allows the ninja to transform themselves into any person or object. This allows the ninja to move with stealth or to trick their opponents. Description:[Requires a chakra channeling blade only received by Kenkaku]]]The user creates a field of chakra around the blade that increases it’s slicing power, being able to cut straight through trees, flesh, bone and even steel depending on the level. The higher the level used, the more thick the field will be. Description:[Requires chakra channeling blade/Must know Fukyuu no ha]The user sends out a slash of chakra forward by swiping their blade. The slash can cut through most maerial, including steel used for kunai and shuriken. Description:[Requires chakra channeling blade]The user can channel fire chakra into their blade to form extreme heat on it causing flames to erupt. The slightest touch from the blade, even a near touch, can cause a severe burn to the victim. Description:[Requires chakra channeling blade]The user channels wind chakra into the blade as air extends two meters from the blade, increasing its reach significantly. The air is as strong as an A Rank Fukyuu no ha. Description:[Requires chakra channeling blade/Must know Fukyuu no ha]The user stabs forward multiple ttimes while Fukyuu no ha is active, unleashing a flurry of powerful blue stabs of chakra that can stretch to over 1.5 miles. Description:[requires Ooki ku moe ruyouna ha]The fire version of mobile slicer, it has the same effect in addition to setting ablaze anything it goes near and giving severe burns to anybody near it. Mastery:Have you mastered this jutsu? Yes or No remember you must go through the training of mastering a jutsu to be able to say yes. Description:Katon • Gouryuuka no Jutsu is a Ninjutsu technique utilizing the Fire Element. After forming the needed hand seals, the ninja will expel dragon head fireballs at their opponent. These powerful fireballs can punch through concrete. Description:Katon • Kasumi Enbu no Jutsu is a Ninjutsu technique utilizing the Fire Element. The ninja does a string of hand seals and then proceeds to blow a large combustible mist at the target. When the mist hits flame, it will ignite in an explosion of fire. Description:Fuuton • Reppushou is a Ninjutsu technique utilizing the Wind Element. After forming the needed hand seals, the ninja will send a strong gust of wind towards his target. When acting in conjunction with another thrown weapon, the wind can increase its power and deadliness. The sound of the waterfall crashing into the docile oasis could be heard from a short distance, the young ninja's breath was shaky and uneven. He knelt down with his blade in his hands. The weapon he became familiar with over the years. He closed his eyes as he took in his shaky breaths. He slowly unsheathed his blade, listening to the steel sword slipping out of its sheath. He took it out all the way and opened his eyes slowly. His hands shook as he looked at the blade nervously. Kaonajimi, the blade he grew to love and wield with great strength and swiftness. He stood up and looked at a nearby boulder. He held his blade unsteadily on his side. It had seemed no matter how hard he tried he had the inability to hold the blade straight, nowhere near as perfect as Him could hold it, but he was confident that his revenge alone would drive him to his success, he didn’t need the “steady hand” Him was always telling him about. He held the blade in front of him and slowly let the chakra flow into it, a faint blue aura could be seen around it. Kenkaku walked as silently and slowly as he could. He looked onto the waterfall crashing with a sillouhette in the distance. He was there, just relaxing. This was Kenkaku’s perfect chance to strike, his chance to kill Him. He choked down his saliva, a bead of sweat trickling down his face. He ran furiously forward and held his blade high, yelling out loud. He swung down at his hated master, but to no use as it was block by his sheath. He brought it back up and swung to the side. He couldn’t fully comprehend what had happened in that moment. He heard the sound of clashing steel as his blade flew out of his hand, landing into the ground. He felt the cold steel of his master’s blade on his neck. “Damn you, I’ll kill you.” He uttered through his teeth. Kenkaku breathed deeply as his eyes stood shut listening to the sound of the water. All those years ago, he was so naïve to everything, that’s why he never succeeded at his task. Sometimes he wished that Him was still alive, so he could kill him. He also wondered why he had taught him so much after taking everything away from him. No matter what it was, now was now and all he could do was remain calm. The now older, wiser swordsman stood up slowly with his blade steady at his side. He opened his eyes and swung his blade, straight and swift. The waterfall stopped as Kenkaku sttod in his post slash pose, his blade straight and still. The waterfall crashed down into the calm waters again as Kenkaku smiled to himself. You do know you can have about 210 skill points ^^ and you can have up to 30 jutsu. You start as a Genin...and thus only have 50 Skills points. You can only have 6 E ranks, 2 D's and One C rank. "Thats him...Minato Hit- Wait....Is he Smiling?". Sorry but his rank says Tsuchikage which we're in need of. So I'll allow this one. If you are going to put 50 points to those skills you can not have A or S ranked jutsus for both of those skills, you can only have B-rank or below. You only have 12 Jutsu... You can have 18 more you know..